Worcester is the second largest city in New England, with an estimated population of over 180,00 people. 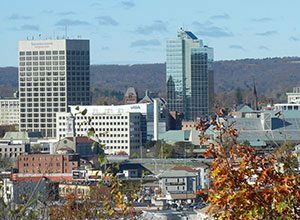 Located 40 miles from Boston, Worcester contributes heavily to the economic and cultural landscape of the Metro West region. The city is easily accessible via I-290, I-495 and the Massachusetts Turnpike (I-90). Additionally, its location allows residents and visitors reasonably-close access to Providence, RI and Springfield, MA. Worcester is home to several higher learning institutions, hospitals and other locally-based organizations. Recreationally, Worcester is home to two minor league sports teams, as well as a large amount of landmarks and points of interest. Due to the presence of many commercial businesses, as well as a high population of people, Worcester is an area in which JD Contracting frequently does business. From smaller projects to commercial build outs, we are able to offer a wide variety of services in Worcester. To request an estimate on an upcoming commercial or residential project in Worcester, please contact JD Contracting today!